In my early teen years, my best friend and I would about half a mile from her house to a little strip mall that had a bakery. We would buy a cannoli, get snacks and drinks from the convenience store across the street, and then walk a mile back past her house to the Barnegat Bay. We would sit near the shore and enjoy our snacks and savor our cannoli. I love cannoli cream. I could eat all the cream from all the cannolis and be content. Forget the shells. The cream is the important part. The flavor of ricotta with a hint of cinnamon and a touch of vanilla is scrumptious. With summer coming I’m on an ice cream kick and what better way to enjoy cannoli cream than frozen into a cannoli ice cream! Pour into an ice cream machine. Freeze according to the manufacturer's instructions. If using chocolate chips you can add them during the last few minutes in the machine or just sprinkle on top. Can you use whole milk instead of the almond milk? Yes, but it will increase the carbs. I just made this today, and let me tell you, this is some delicious ice cream! I discovered that the container I thought was heavy whipping cream was half and half, but decided to go ahead and make it, knowing the carb count will be a little higher per serving, and I am so glad I did. I also didn't measure anything other than the liquids, and used almost a 1/2 cup of ricotta more than required. I definitely used more cinnamon! My teen daughter just told me it tastes like snickerdoodle ice cream and that I NEED to make it again! Thank you for sharing this lovely recipe that is sure to become a staple in my house. ps I found some adorable single serving ice cream cups with silicone lids on Amazon that I use to divvy up the ice cream so that I'm not tempted to eat more than I should. Made this several times and it’s AWESOME! Taryn, I'm really sorry I said it was bland. I just had some today and it tasted far far better to me. Perhaps I was just having an off-taste kind of day the day we made this. It really is good. Flavor was bland. Even with added vanilla. I'm sorry you found it bland. Have you ever had cannoli cream before? Even the real stuff is basically just ricotta cheese and powdered sugar so the flavor of the ricotta can shine. This looks yummy!!! Could you use marscapone cheese instead of ricotta? This recipe is FANTASTIC! my child is on a STRICT ketogenic diet. His classroom was having an ice cream social, and I sent him with a cup of this, he loved it, and my hubby and I ate the rest. It. Was. Delicious. I subbed in 3T coconut oil for the glycerin, but I'm not sure if it helped, our freezer is quite cold, and it was still a brick. 30 seconds in the microwave helped thaw it quickly. I also used a stevia type sweetener, 3/4 t worked for the plain recipe. I dont have a churn so I put it in a gallon zip top bag and kneaded it every half hour or so until it was almost set, then transferred it into a bowl. Did another batch last night and added 2 heaping Tablespoons of cocoa powder, and another 1/4 t sweetener, and it is really good too. This will be our go to ice cream base. I'm even shopping ice cream makers it's so good! I cant wait to try it with fruit added in. Yes! I'm a Jersey girl :) I grew up on a town on the Barnegat Bay and now live more north in Central NJ. 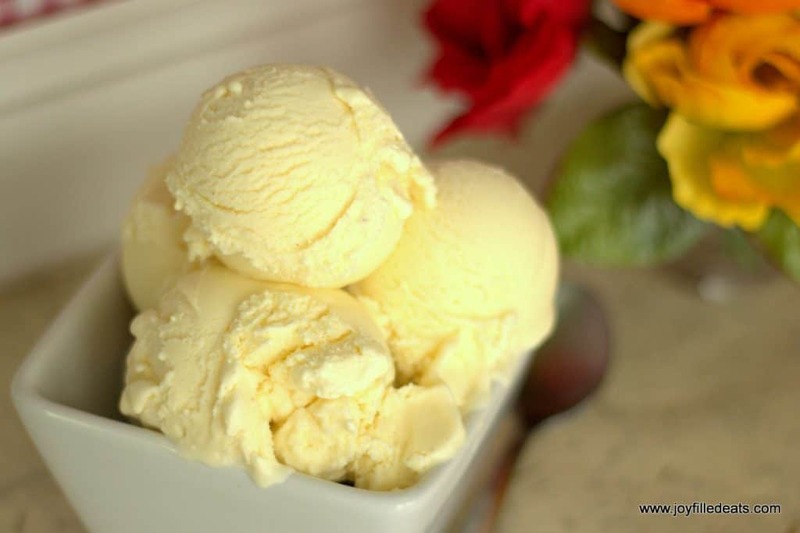 You could use a low carb milk such as Fairlife but the ice cream may be icier. If you could use a little cream, even light cream, that would help. Thanks for your suggestions 'Jersey girl'! I grew up in a woodsy town by the Barnegat Bay, now I'm about a block away. I have fantasies of affording a house by the beach. Thanks again, enjoy our heat & humidity! I have made two other Cannoli ice cream recipes neither of which would set (ricotta soup). I've been hesitant to try another recipe but everyone's comments seems pretty successful. I have a Cuisinart machine and works fine with other recipes. Anyone had any issues with this not setting? Did you have to heat the other recipes? I've never had trouble with this setting but I don't mind using raw egg yolks. As long as your bowl is frozen solid and the mixture is cold it should set without a problem. The only problem that I had was the ricotta cheese had a slight aftertaste. I probably would try a different brand. I used Galbani cheese which was a little grainier to me over some of the others. 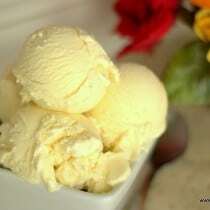 The vegetable glycerin helps the ice cream to stay scoopable in the freezer. If you don’t mind letting the ice cream sit out at room temperature for about half an hour before scooping you can omit the glycerin. Loved the ice cream...it is rich and wonderful...but I am confused about the carb count. Everytime I imput it in a calculator it comes out with 9g carb and I used the exact ingredients...could you help with the confussion? Are you subtracting the sugar alcohols in the sweetener? Those do not count in the carb count. I subtract them manually before adding my nutrition table. I finally bought ricotta cheese to make this! The flavour is awesome, however, the texture is very grainy. I have a vitamix and blended this on high plenty long, so I'm a little confused. Or is this just the nature of the ice cream? It's got the same texture as the ricotta. It could be the sweetener that is grainy. The ricotta has more texture than a cream based ice cream but shouldn't be grainy after blending. I used Gentle Sweet. It's not like the grainyness of un-powdered sweetener. It's the exact same as when I take a spoonful of the ricotta. Could it make a difference that it's whole milk ricotta? Or do brands matter? The brand might matter. I would try blending the ricotta on it's own before adding the other ingredients. With a decent blender it should get smooth. I used light ricotta and it was not grainy at all. Great recipe! The only thing I missed were the pistachios! Thanks for sharing. This is a keeper! Maybe you didn't powder the sweetener first? Any thoughts on the best place to purchase pasteurized egg yolks? Thanks so much for the help! Sadly, the locator says there isn't anywhere in my area that sells these. I'm open to other options if anyone knows of any! Thanks again. I made this last night. Easy and delicious! Feels like I'm cheating, but nice to know I'm still eating low carb! :) I used MCT oil instead of the glycerin since I didn't have any of that on hand. Thanks for all of your great recipes! I've made at least 8 of them and they are all amazing! Great idea using MCT oil, as it will help bump up the fat ratio! Wondering about the glycerin Where do you get it? I order it from Amazon. I had Stevia Glycerite but no glycerin so I used the glycerine instead. I was hoping it was close enough. Since the ice cream didn't "stay" scoopable (but was scrapeable at least) I'm thinking it isn't quite the same. Can you share which glycerin you purchase? I take it any food grade vegetable glycerin will do. Which ones have you tried/liked? Thanks! One question, how much is a serving size? it says in the directions 8; 1/2 cup servings. I don't have an ice cream freezer can i put in a containers and freeze? Without an ice cream machine, you could make this into popsicles but not ice cream. It would freeze too hard to scoop. A fabulous treat on the Keto diet! Delicious. Next time I will use the glycerin, as it was a bit difficult to scoop it out. I will also sprinkle crushed pistachios on it for a authentic cannoli taste. Just made this but I tempered the eggs because my husband doesn't like the idea of raw eggs. I warmed all ingredients in a pot, slowly added the warmed cream base and put the eggs back in. Will this ruin your recipe? It didn't state to do this and I noticed the ricotta seems to still sit at the bottom of the pan a bit. Think this will work? I think it will come together when you churn it. In the future I probably would've warmed all the ingredient except the ricotta and then just whisked that in afterwards. That would help bring the temperature down quicker as well. Thank you! Kept it in the fridge overnight and will be churning it tonight. I'll let you know if it turns out but that is great info. So hoping this tastes great, I loved Cannolli before I went low card and this would be a great substitute. Can I just say I love you!!!!!!! This is some of the best ice cream I've made so far. It's spot on. Thank you! Can you please explain the temper process for base if concerned about raw eggs. Thank you! 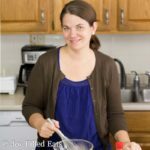 This link explains it really well: http://simmerandboil.cookinglight.com/2015/06/24/how-to-temper-eggs-ice-cream/ You basically heat the mixture slowly so heat the eggs and then chill it. Could I use liquid stevia instead of the mix? And if I don't have a ice cream maker would it still freeze alright? Yes to the stevia. Just add it to taste. Without an ice cream maker this will freeze pretty hard. You could make it into ice pops though. Ohhh ice cream pops dipped or drizzled with skinny chocolate would be amazing!! I add them if readers ask. You can always plug in the recipe to caloriecount.com or another nutrition calculator. I don't personally use them since the Trim Healthy Mama way of eating doesn't require any counting. I will add them to this post in a few minutes. Just made this it is soooo good!!? Thank you for sharing it. This is fabulous! I made a double batch and can't get enough! 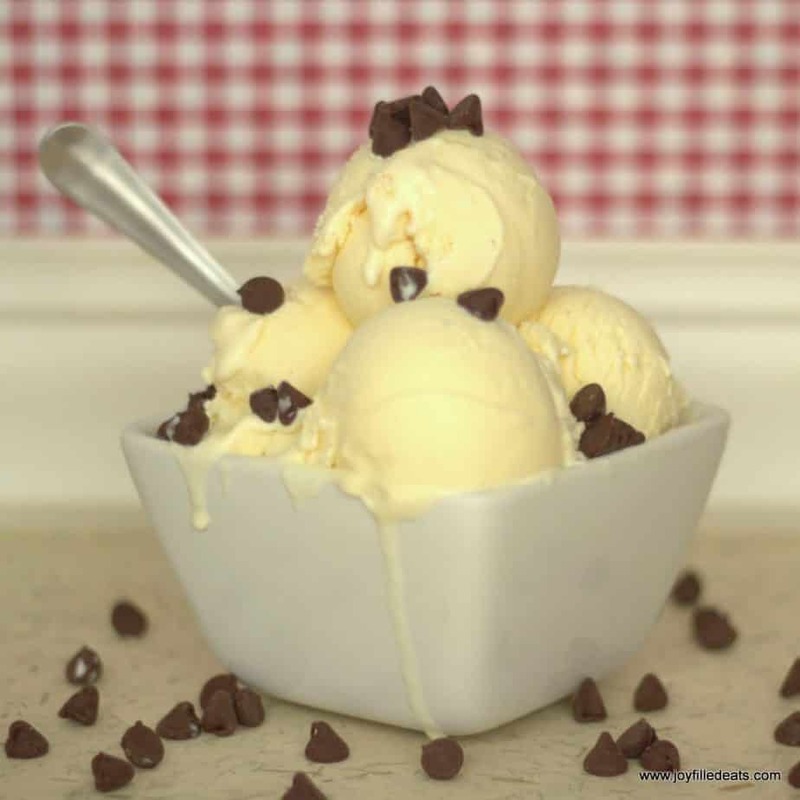 Thank you for an amazing recipe for ice cream! My Mom and I love this ice cream! It sooo rich and creamy and really reminds me of cannoli cream! This is just what I need to curb ice cream cravings this summer. Thanks so much for this fabulous recipe! What is a good, but not very expensive, ice cream machine to purchase? Hi Joy, my cuisinart one has been going strong for almost ten years. I have the cheapest model which is under $50. If you have a Bed Bath Beyond near you and a 20% off coupon that might be the cheapest place. Made this tonight - all my family loved it! So creamy and delicious. Thanks for a great recipe!! 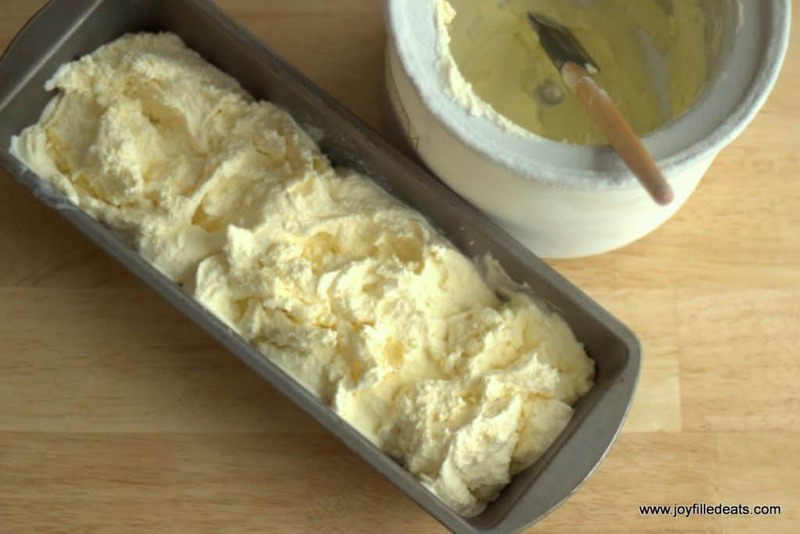 Do you have to process this ice cream in the ice cream maker or just freeze! You need to churn it in an ice cream machine. I have a question : is it possible to use splenda in place of THM or blend of xyliotl , erythritol and stevia ? I personally don't use splenda so I'm not sure how much you would use. You could just taste as you go. I have not. The ricotta is what really makes it taste like a cannoli. I think cottage cheese would work for texture but not for taste. I made this ice cream tonight and all I can say is YUM OMG I am loving it!! My whole family really loved it and I love how easy it was too! I made this last night and we loved it. However, as with most sugar free, low carb ice creams, it was hard as a brick the next day. I used the glycerine as suggested. Any other suggestions to try for next time? Thanks for a great recipe! It might vary with the temperature of your freezer. Mine stays scoopable in my regular freezer but freezes solid in my deep freezer which is colder. You can just let it sit out at room temp for a bit to soften.